Volume III, Number 11 PUblished by Students Of New College, Sarasota, Florida November 18, 1966 SEC Defeats lntervisitation Change Above left, first-year student Ron Kronenberg, one of several observers at Wednesday's SEC meeting, waits to be recognized by the chairman right, SEC members vote on a budget request; below, Vice Pres. Davis.' Voting Split 5-3 A motion to delete the limitation of hours from the student rule on intervisitation was defeated by the Student Executive Committee Wednesday. Voting five against and three for, the SEC ended consideration of a motion originally made three weeks ago by first-year repre-sentative Jon Shaughnessy. ...... -.------. :....-Wednesday's action came aft and Rachel Fmdley. Jerry Neu-lengthy and often heated discussi:-garten, Kenji Oda and Jon Shaughby representatives and the 21 ob-nessy voted for. servers who were present. Vice l_ast president Paul Davis and Dean of n 1 g h t abolitlon of mtervuitation Students RobertNorwine were pre-hours now has five,;rotes "subject sent as was Assistant Dean Arth to student approval. He said four Mill'er ur of those votes are certain and one V against the motion were h in g e s on whether students want representatives Katie Smith, Lee the rules. Crawfort Steve Hall Dav"d Pin" How student opinion will be tes-' 1 1 ted, if it is tested, is tmcertain, SAFC Allocates 75% of Money The Student Activity Fund Committee unanimously approved Monday night appropriations totaling more than 75 per cent of the fund to six student Organizations and the amount of their appropriations are: International Affairs Conference, $750; Literary Supplement $500 Film Committee $900; Campus Radio Station, $400; Tutoring Program, $SO; and Phominutes of the SEC meeting, al-tography Club, $100. though it was recommended for AU d approval by the SAFC. recommen ations rna de by In a statement to the SEC from the SAFCwere approved bfthe Studeot Executive Committee Wed-the SAF C, committee members nesday, although there were dis-made the case for approving the sentingvotes on some allocations. recommendations without change The amount granted to the cam-and outlined the reasoning behind the recommendations made. pus radio station was granted con-"Knowing the student politics ditionally. In addition, in appro-in v o 1 v e d' the statement said, ving the film committee request, "and not being so naive as to be-the SEC stipulated the $900 must lieve that all groups would ask be s p 1 it evenly between the two simply for the amount needed, we tenns remaining in the year. somewhat altered the exact figures A request by the film commit-which the student questionnaire tee for an additional $100 to pur-gave us to worl< with. Believing chase a film editing machine was the International Affairs Commit-not reported as approved in the tee to be the most likely to be a-according to Neugarten. Possibilities are a referend\.Uil or a student meeting, he said. No action will be taken within the next few days, he added, Discussion of intervisitation began with a report by Pini on a questionnaire on the subject distributed to all students. According to Pini, 146 students answered the questionnaire, and of these, 141 said they felt intervisitation hours do not interfere with their academic lives anddonotcause undue social pressure. Pini went on to report 108 students said on the questionnaire they break the current hour limitations, and one said he breaks the roommate's consent requirement. Of those who replied, he said, 89 want to maintain the roommate's consent requirement, 37 want no restrictions on hours, 24 prefer the present hours. Katie Smith reported an informal poll of freshman girls showed they would prefer to keep intervisitation rules as they are rather than have the administration enforce them. Oda said a similar poll of 18 second-year students picked at random showed a 9-9 split on the question. Elmendorf Sees 'Good Chance' ble to supplement their funds, we made the most drastic cut in their request, cutting it considerably be law w h at the students even presented as a deserving figure. Shaughnessy asked why a question on s t u d e n t versus administration enforcement of intervisitation rules was not put on the questionnaire. Neugarten added he felt this is the crucial question. To Meet President John Elmendorf said yesterday the college has 11 a very good chance" of raising the $2 million necessary to qualify for another $1 million offered by an anonymous fotmdation. ChoirToDebut; Paul Goodman To Talk Tonight The New Co 11 e g e Choir will make its debut performance tonight in the first part of a twopart forum. Author and critic Paul Goodman will s p e a k following the choral group's performance. Under the direction of Choral Director Jerome Meachen, the 15-member choir has been practicing regularly for some weeks now. Their program tonight will include French and German music from the Renaissance and rounds by H in d e m it h, Beethoven and others. Goodman, who has been called the "utopian agent provocateur," is the author of "Growing Up Ab surd," included on the first-year reading list. Writer Michael Harrington, in a discussionofGoodman in the "Atlantic" for August, 1965, said Goodman believes American society is not only immoral and aesthetically u g l y, but also, using Goodman's words, "ineffective, economically wasteful, humanly stultifying and ruinous to democracy." $2 Million Challenge Announcement of the 'l::hallenge" gift was made Friday to the Board of Trustees. According to board chairman Dallas Dort, the trustees also learned of important steps taken to meet the two-for-one matching provision. American colleges and universities had gone through periods of severe economic crisis. "In every case, 11 he said, "there was a person, a family, or a rellatively small group of thoughtful persons who recognized the need, accepted the irresponsibilities, and contributed of their capital to meet the emergence. "Knowing also that the Film Committee's request was probably the least understood by those students returning forms, we raised considerably the figure which the students had recommended, the statement went on. At a meeting Monday, which the committee described as "reasonablywell attended," proponents of each r e q u est explained their activity and answered questions from amcmg the approximately 30 students there. Vice president Davis, saying he had "a few comments to make, told those assembled, "The student representatives have demonstrated a singular lack of faith in dealing with us (the administration)." 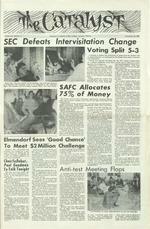 He said it was agreed the questionnaire would be shown to members of the administration before it was published, but "we saw no( Continued on page 3, column 5) Approximately a dozen members of the board have agreed to assume personal responsibility for raising at least $500,000 before Aug. 31, 1967, when the current fiscal year ends. Elmendorf said yesterday the college is "beginning to get in touch with specific known friends of the college 11 who may help to raise the rest of the money. Anti-test Meeting Flops Because the gift offer represents an exception to its policy, the foundation has requested its identity remain tmknown. Elmendorf said any "undesignated ftmds, that is gifts to the college which are not made for any specific purpose, may be credited toward the $2 million requirement. The gift .may be used to help defray the operating costs of the college. Approximately $1.5 million is expected to be realized from the sale of off-campus real estate now owned from the college and from the regular operationsof the development program. Remarking on the opportune time of the gift offer, Elmendorf said, "We can now plan for the longrange development of New College with the highest confidence. 11 George C. Collins, chairman of the Development Committee of the Board of Trustees, told the board members a number of well-known A meeting called last night to plan action against the test to be given Tuesday in the Social Sci ences core program was termed a failure by its organizer, first-year student Lee Crawfort. Crawfortsaidhe called the meeting because he feels the Social Sciences faculty in charge of the core program is doing "everything possible to make tne tl!st required," in contradicticm with the idea of no tests being required during the first year except comprehensives. Only two other students joined Crawfort in the meeting, first-year students Jon Shaughnessy and Stephen Parr. When asked why attendance was so light, Crawfort said, "People must not care that much." Because only two others showed up, no plans were formulated, Crawfort said. Crawfort complained the tests were to be the traditional closed book examinations instead of takehome tests, which are frequently utilized in other courses. He also obJected to the grading system to Lee Crawfort, on chair, leads discuss1on on anti-test campaign. be used, "excellent, good, fair, poor, fail." This, he poimed out, is hardly different from a traditional grading system. When asked what he planned to do Tuesday, Crawfort replied he, along with Parr and Shaughnessy, might "picket" the examination.